In her Big Idea piece for The Strange Case of the Alchemist’s Daughter, author Theodora Goss makes an observation about classic monster stories that I, personally, never picked up on, but now that she’s pointed it out, seems obvious. It says something about me that I missed it, and something about her that she’s used it as a cornerstone for her novel. I was studying Frankenstein and his creature because I was writing a doctoral dissertation on late Victorian gothic monsters–Dr. Jekyll and Mr. Hyde, Count Dracula, the Beast Men on the Island of Dr. Moreau. Mary Shelley’s Frankenstein isn’t late Victorian, of course, but I wanted to understand this iconic monster narrative so I could apply some of what I learned to those later works. Well, one thing I learned is that there’s almost always a female monster, and she’s almost always destroyed. In Bram Stoker’s Dracula, which was deeply influenced by Carmilla, both vampire Lucy and Dracula’s brides are staked and beheaded. In H.G. Wells’s The Island of Dr. Moreau, the Puma Woman escapes from Moreau’s terrible House of Pain and kills him, but is herself shot. In Arthur Machen’s The Great God Pan, the mysterious Helen, who has the power to summon Pan and his minions, is forced to hang herself. You don’t even have to be a technical monster: in H. Rider Haggard’s She, the irresistibly beautiful Ayesha burns in the fire of immortality–which is a good thing, because she was thinking of claiming the British throne. And where would that leave Queen Victoria, I ask you? Ayesha isn’t a monster, but she is monstrous–a woman who has the power to kill with a gesture, and whom no man can resist. No wonder the novel has to get rid of her. We find the same thing earlier in the century and across the pond with Nathaniel Hawthorne’s “Rappaccini’s Daughter,” the beautiful but poisonous Beatrice, who kills herself so that her lover may live. Beatrice gets more sympathetic treatment than other monstrous women–she is, at least, a romantic heroine. Like Ayesha, she gets to tell part of her own story, although the focus of the narrative is not, finally, on her, despite Hawthorne’s title. But she too dies in the end. They all do. One exception is Queen Tera in Stoker’s less-known novel The Jewel of Seven Stars, where the resurrected Egyptian queen triumphs at the end–but guess what? In the second edition, the ending was rewritten (perhaps by Stoker, perhaps by his editor), and she too is exterminated. The field of monster literature is strewn with female bodies. Why? Well, monsters die just in general, so it’s not all about being female. But female monsters are presented as particularly dangerous. Frankenstein does not complete his creation because she might breed with the male monster, and their progeny might outcompete man. Beyond that concrete biological danger, a female monster does not fit the cultural category “female” as it was conceived in the nineteenth century (or earlier: we have a fearsome female monster who must be destroyed in the classical figure of Medusa). Carmilla must be destroyed specifically because she threatens the good women. She might–gasp–turn them into monsters like herself! So the big idea behind my novel is really very simple: the female monsters did not die. They’re alive, and they’re telling their own stories. That doesn’t mean all the female characters in the novel are good–villainesses are too delicious to dispense with, and anyway, I wanted to make sure that in my narrative, female characters got to be all sorts of things, both good and evil. In my novel, the women talk–a lot, sometimes over each other. But hey, they’ve been silent (and silenced) for so long that once I let them start, they had an awful lot to say. They tell us their stories as they really happened. (Jekyll had a daughter! The Puma Woman survived! Frankenstein’s female creature was not disassembled after all!) 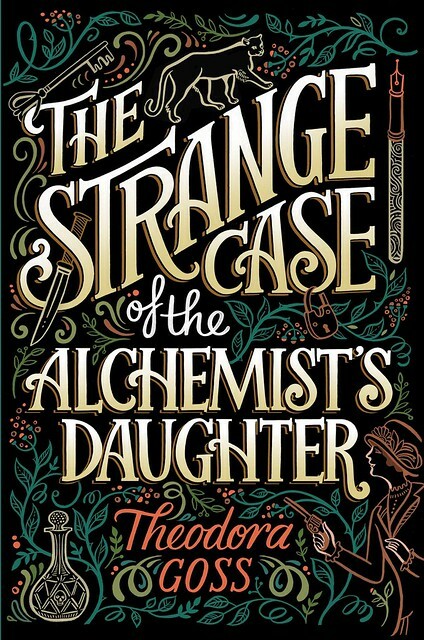 I wrote The Strange Case of the Alchemist’s Daughter because I love the older novels–I can’t imagine a better afternoon than one spent with nineteenth-century monsters, with tea and cookies on a nearby table, while outside the mist and rain create a suitably gothic atmosphere. But this time, I wanted the women to have their say . . . I was going to read this just for its lush, gorgeous cover art (hear that, all you art naysayers?!?). But now I have more reasons to read it! Anticipation is a surprising way to start the day. Basically powerful women get murdered, even the innocent ones. Our modern equivalents are sneaky. They include calling Kamala Harris hysterical because she asked Jeff Sessions tough questions. Oh wow. Yeah, can’t unsee that. Really interested in the book. I can see interesting parallels between the way the Victorian gothic writers you discuss reacted to the growing refusal of women to stay invisible in 19th century England, and the way H. P. Lovecraft and his circle reacted to the growing refusal of people of colour to stay invisible in 20th century America. Both situations revealed some unpleasant attitudes – but they also both produced some pretty cool monsters. I started thinking about classical analogs and then Ms. Goss dropped Medusa in there and I was sold. ‘Rappaccini’s Daughter’ is one of my favourite horror tales of all time, and I’ve always thought it would have been improved only by Beatrice surviving and becoming some sort of avenging feminist angel. This book sounds SO. GOOD.